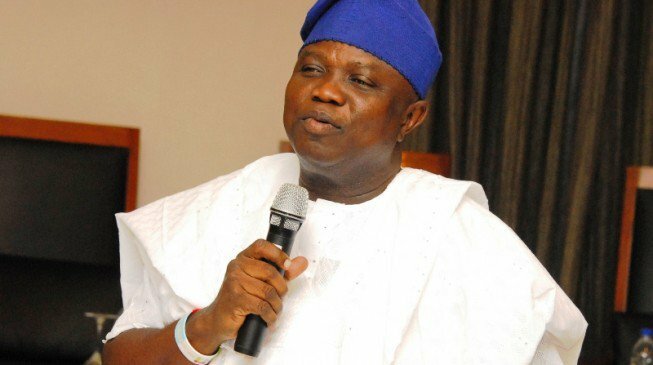 Lagos State Governor, Mr. Akinwunmi Ambode on Monday said the priority of his administration for educational institutions at the tertiary level is for them to nurture students to become wealth creators and innovators capable of contributing positively to the communities and the nation. 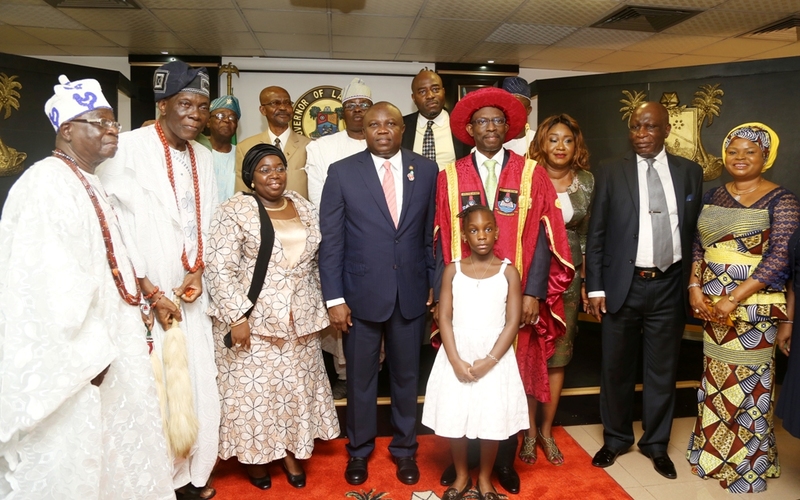 Ambode, who spoke at the Lagos House in Alausa, Ikeja while inaugurating Professor Olanrewaju Adigun Fagbohun as the 8th substantive Vice Chancellor of the Lagos State University (LASU), said the State Government was not just passionate about academic excellence, but equally committed to raising the standards and providing the necessary infrastructure for tertiary institutions in the State to deliver outstanding results. 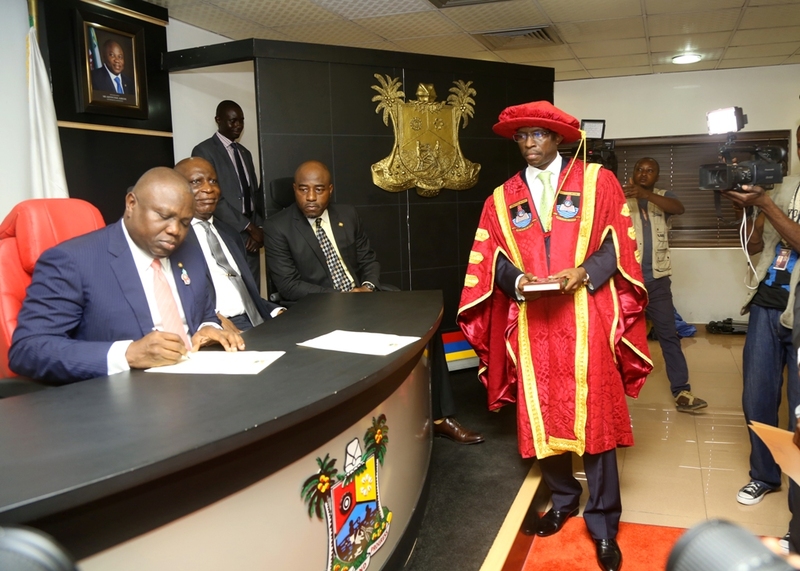 While insisting that he was not oblivious of the unique position that LASU occupies, Governor Ambode charged the new leadership of the institution to re-focus on intellectual engagement, show leadership and brace up to the developmental and academic challenges of an emerging globally competitive citadel of learning. 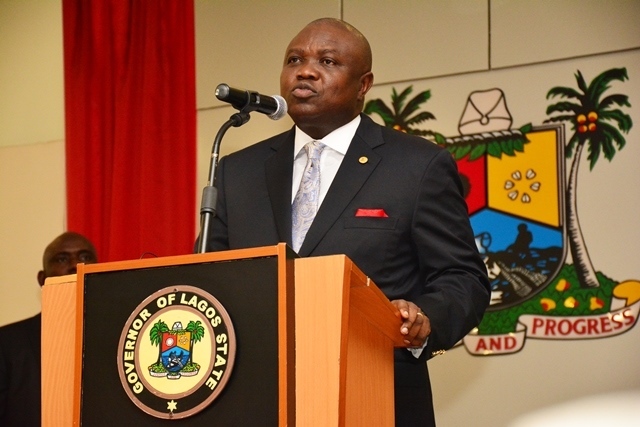 In providing the roadmap for LASU, Governor Ambode recalled that the journey towards the actualization of his vision for the institution began on September 22, 2015 when the Governing Council was inaugurated, and that to take it to realization, he equally assented to a Bill amending the enabling law setting up the institution. The amendment, according to the Governor, was fundamental as it will address pertinent issues that have for long created discord within the academic community. 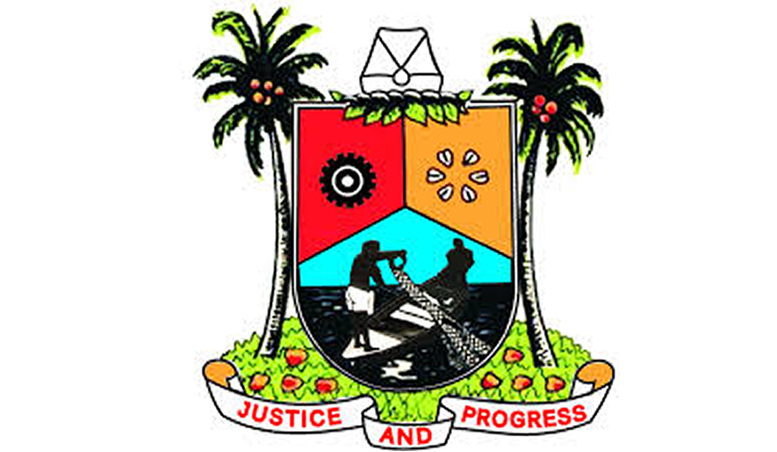 Besides, Governor Ambode recalled the protracted crisis in LASU which was recently resolved, and said Professor Fagbohun was appointed to put things right in the institution after a thorough screening and selection process by the Governing Council. 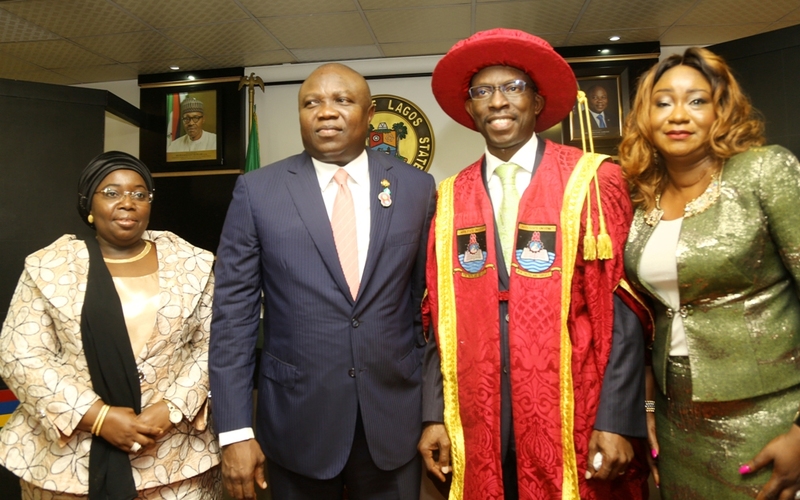 He said: “Over the past few years, LASU has had her fair share of successes and challenges. As a result, there is a lot of work required to propel the University to a world-class status. “As we set our sights on a more viable future, we must ask ourselves some important questions: How successful are our Students after they graduate from our institution? What is the University’s contribution to our Community, our Country and the World? “I urge that we all ponder over these questions and use today’s event as a rallying call for all to join hands to move LASU forward. “There is no gainsaying the fact that the new Vice Chancellor is assuming office at a challenging time in the history of the University. He has the task of rekindling hope and rebuilding confidence in the system after a protracted crisis. In this task, he requires the support and cooperation of all the stakeholders particularly the academic and non-academic staff as well as students, all of whom he must carry along to enthrone a peaceful atmosphere that will promote academic excellence,” the Governor said. In his acceptance speech, Professor Fagbohun said the passion that he has for the job is such that he was already running, adding that LASU shall become great again. He said: “My strategic imperatives are to restore peace, foster high level scholarship, make gains on previous gains, create an environment that can attract funds and make the institution a valued partner to the Lagos State, the Nigerian nation and the international community. “From this moment, the language of engagement is inclusive governance, consultative approach and the will mantra. We will robustly and consistently engage in open, honest and constructive communication on critical issues such as welfare of staff and students, among others. Overall, we will ensure that our dear University worth its name. “We will make His Excellency and Lagos State proud. I am highly confident that we can do it. My confidence stems from what I know of the University and the enormous energy of my colleagues both academics, non-academics and our dear students. I say LASU will become great again,” Professor Fagbohun said. While assuring that discipline and rule of law would be uphold, Professor Fagbohun urged Governor Ambode and all stakeholders in the LASU project to join hands with him in the task of putting the institution back on the front row of academic excellence. 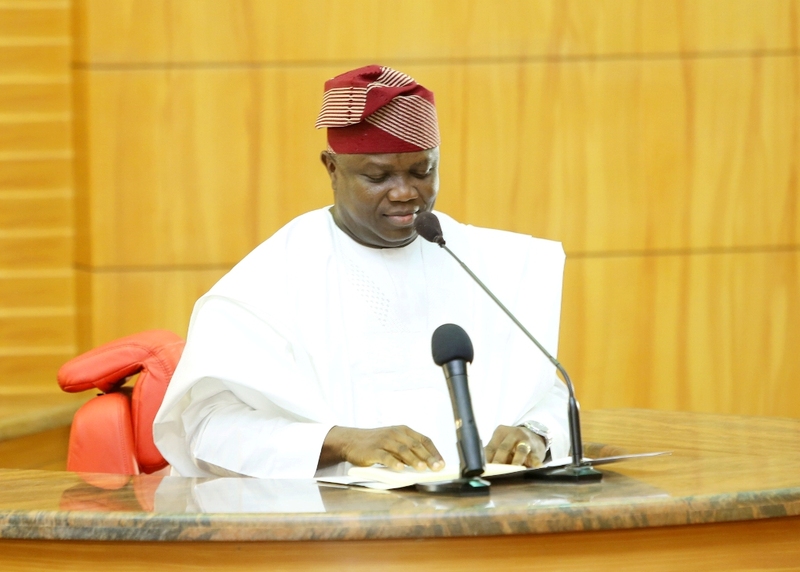 Lagos State Governor, Mr. Akinwunmi Ambode on Sunday said the outcome of the 2015 elections was an eloquent testimony of God’s love for Nigeria. Governor Ambode said despite the predictions of anarchy and possible unrest, God showed His mighty hand upon Nigeria and for the very first time, the nation experienced a smooth and peaceful transition from one civilian government to another, and the ruling party became the opposition. The Governor, who spoke at the Lagos House, Ikeja during the 2016 Annual Thanksgiving Service, also reassured Lagosians of the determination of his administration to work hard to achieve all-inclusive progress and prosperity for all in 2016. Governor Ambode said despite the bleak economic outlook predicted in many quarters, Lagos State will grow in leaps and bounds and take its rightful place among the major city-states of the world. “Our entrepreneurs will experience a boom and our State will work for everyone. 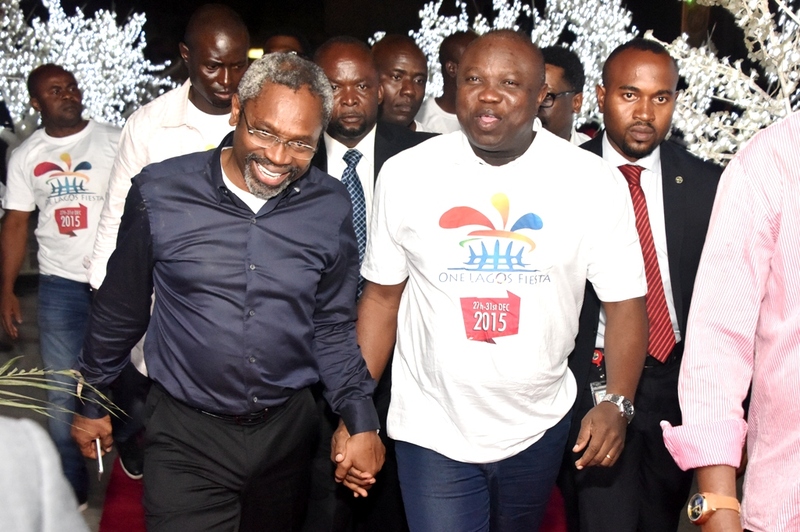 We are determined and God willing, we shall achieve all-inclusive progress and prosperity,” Governor Ambode said. “The fact the we are gathered here is enough proof that we are covered under the banner of the Lord’s grace and that He surely answers prayers when He is called upon. It is with this abiding faith that we call on Him as we commence another journey in 2016,” the Governor said. He acknowledged the religious and spiritual leaders in the State for their ceaseless prayers and intercessions for the people and government. He specially appreciated the General Overseer of The Redeemed Christian Church of God (RCCG), Pastor Enoch Adeboye and his wife for their commitment in the service of the Lord through persistent exhortations and prayers. 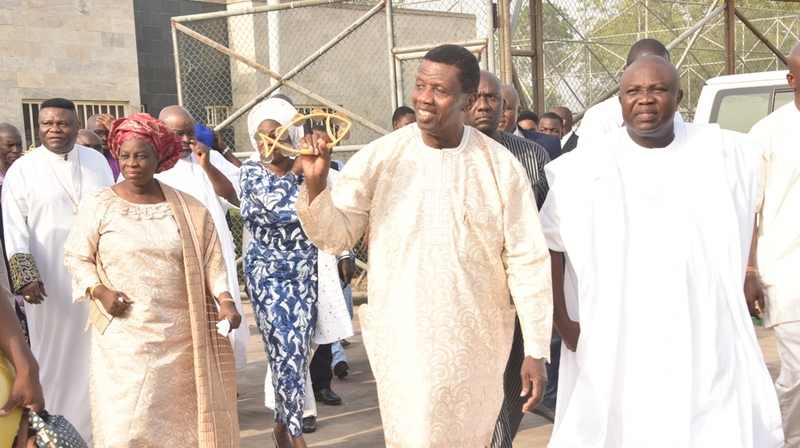 In his exhortation, Pastor Adeboye said despite the predictions for 2016 in the wake of the dwindling oil prices likely to result in loss of jobs, those connected to God can surmount these challenges. He said those who seek to prosper in the New Year must take a stand to be closer to God. Special prayers were offered at the service for the State and Nigeria by clergymen including Bishop Mike Okonkwo, His Eminence, Most Rev. Chukwuemaka Kalu Uche; Pastor Wole Oladiyun, Pastor Wale Adefarasin, Archbishop Adewale Martins, Most Rev. E.A Ademowo, among others. 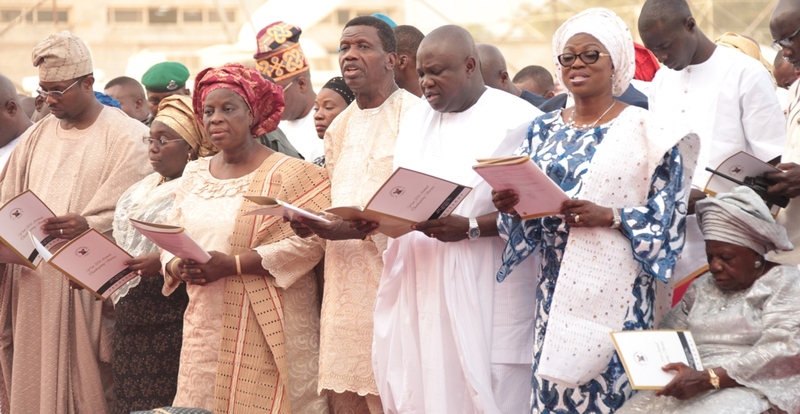 Bible reading at the service were read by Governor’s Ambode’s wife, Bolanle; Lagos State. Head of Service, Mrs. Olabowale Ademola; Lagos State Chief Judge, Justice Olufunmilayo Atilade; Commissioner for Women Affairs and Poverty Alleviation, Hon. (Mrs.) Lola. Akande, and Chairman of Conference of Executive Secretaries of Local Government and Local Council Development Areas in Lagos State, Hon. Alabi Kolade David. 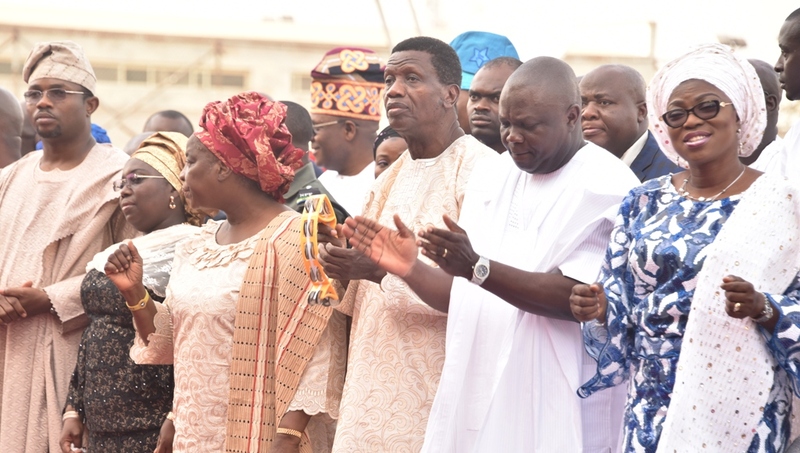 Lagos State Governor, Mr. Akinwunmi Ambode; General Overseer, Redeemed Christian Church of God (RCCG), Pastor Enoch Adeboye; Wife of Lagos State Governor, Mrs. Bolanle Ambode; Wife of General Overseer, Redeemed Christian Church of God (RCCG), Mrs. Foluke Adeboye and General Overseer, The Redeemed Christian Evangelical Mission (TREM), Bishop Mike Okonkwo, arriving at the Y2016 Annual Thanksgiving Service at the Lagos House, Ikeja, on Sunday, January, 2016. Mother of Lagos State Governor, Mrs. Christiana Oluleye Ambode; Wife of Lagos State Governor, Mrs. Bolanle Ambode; Lagos State Governor,Mr. 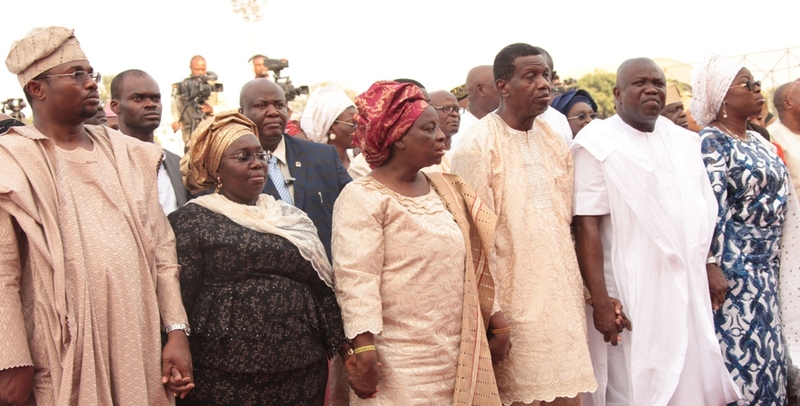 Akinwunmi Ambode; General Overseer, Redeemed Christian Church of God (RCCG), Pastor Enoch Adeboye; his Wife, Pastor Mrs. Foluke and Deputy Governor, Dr. (Mrs.) Oluranti Adebule and her husband, Mr. Saheed Adebule, during the Y2016 Annual Thanksgiving Service at the Lagos House, Ikeja, on Sunday, January, 2016. Wife of Lagos State Governor, Mrs. Bolanle Ambode; Lagos State Governor, Mr. Akinwunmi Ambode; General Overseer, Redeemed Christian Church of God (RCCG), Pastor Enoch Adeboye; his Wife, Pastor Mrs. Foluke and Deputy Governor, Dr. (Mrs.) Oluranti Adebule and her husband, Mr. Saheed Adebule, during the Y2016 Annual Thanksgiving Service at the Lagos House, Ikeja, on Sunday, January, 2016. 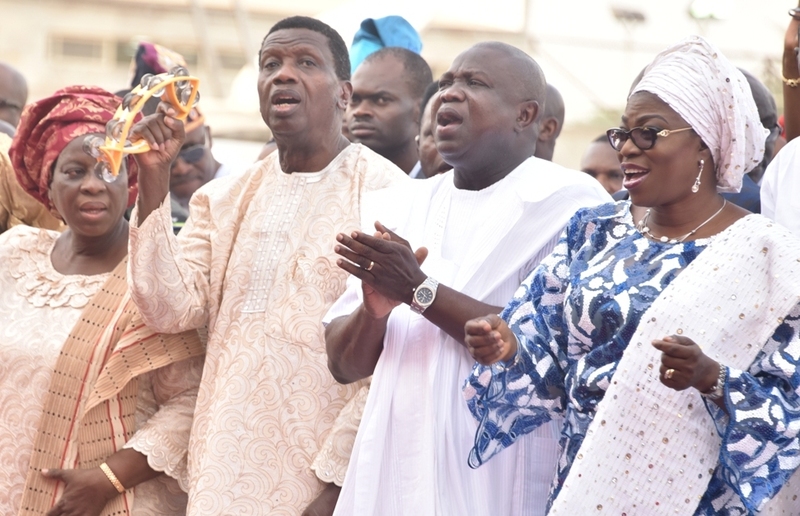 Wife of Lagos State Governor, Mrs. Bolanle Ambode; Lagos State Governor ,Mr. Akinwunmi Ambode; General Overseer, Redeemed Christian Church of God (RCCG), Pastor Enoch Adeboye and his Wife, Pastor Mrs. Foluke Adeboye, during the Y2016 Annual Thanksgiving Service at the Lagos House, Ikeja, on Sunday, January, 2016. 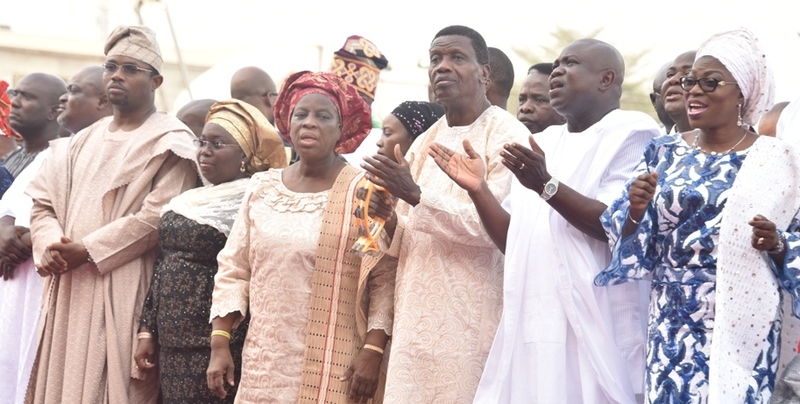 Wife of Lagos State Governor, Mrs. Bolanle Ambode; Lagos State Governor, Mr. Akinwunmi Ambode; General Overseer, Redeemed Christian Church of God (RCCG), Pastor Enoch Adeboye; his Wife, Pastor Mrs. Foluke Adeboye; Deputy Governor, Dr. Mrs. Oluranti Adebule; her husband, Mr. Saheed Adebule and Speaker, Lagos State House of Assembly, Rt. Hon. Mudashiru Obasa, during the Y2016 Annual Thanksgiving Service at the Lagos House, Ikeja, on Sunday, January, 2016. Lagos State Governor, Mr. Akinwunmi Ambode (right), with Majority Leader, House of Representatives, Hon. 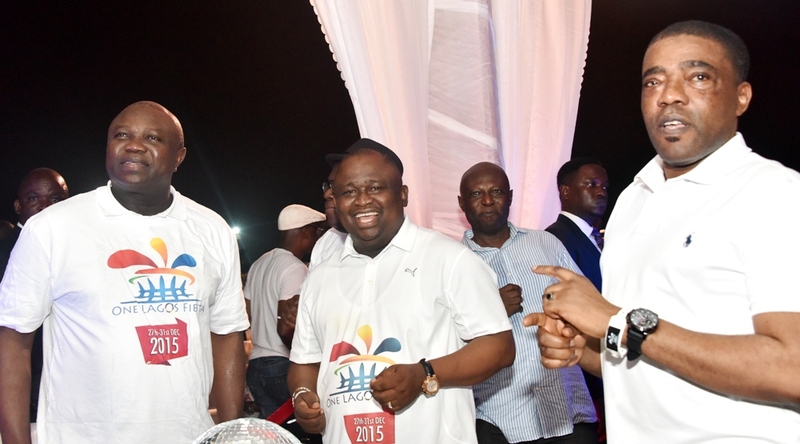 Femi Gbajabiamila (left), during the Grand Finale of the One Lagos Fiesta, at the Bar Beach, Victoria Island, Lagos, on Thursday, December 31, 2015. 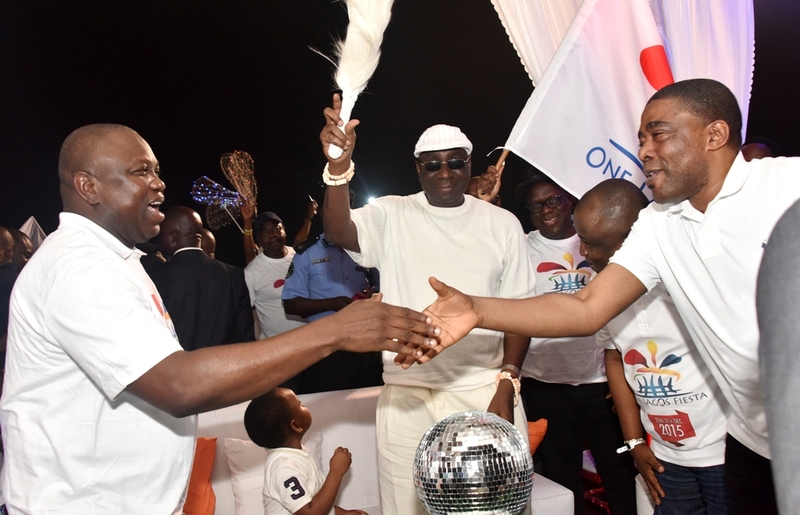 Lagos State Governor, Mr. Akinwunmi Ambode (left), exchanging pleasantries with Oba of Lagos, Oba Rilwan Akiolu I (middle), while Attorney General & Commissioner for Justice, Mr. Adeniji Kazeem (right) waves the flag, during the Grand Finale of the One Lagos Fiesta, at the Bar Beach, Victoria Island, Lagos, on Thursday, December 31, 2015. 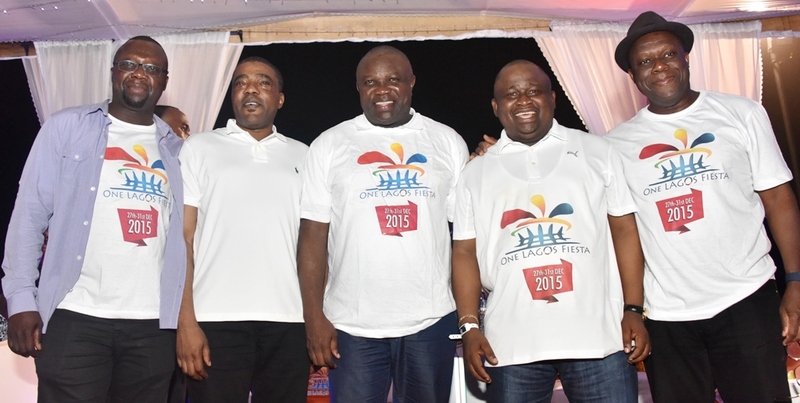 Lagos State Governor, Mr. Akinwunmi Ambode, Senator representing Lagos West Senatorial District, Olamilekan Adeola Solomon and his predecessor, Senator Ganiyu Solomon, during the Grand Finale of the One Lagos Fiesta, at the Bar Beach, Victoria Island, Lagos, on Thursday, December 31, 2015. 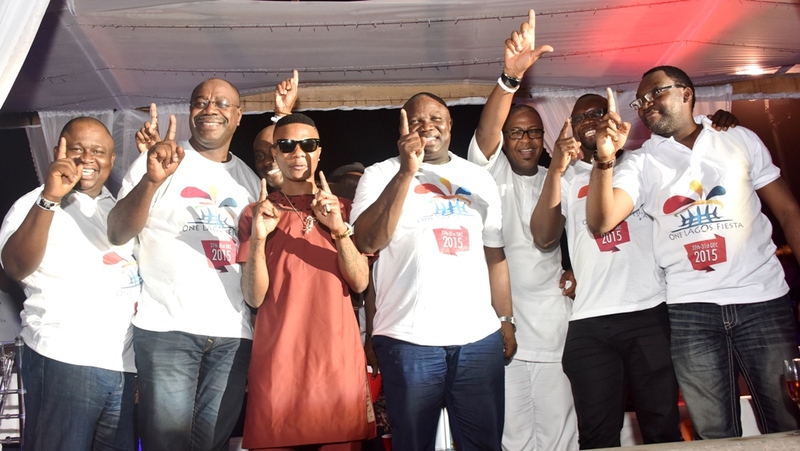 Lagos State Governor, Mr. Akinwunmi Ambode (middle), Senator representing Lagos West Senatorial District, Olamilekan Adeola Solomon; Chairman, Lagos Internal Revenue Service (LIRS), Mr. Olufolarin Ogunsanwo; Afropop Star, AyoDeji Balogun “Wizkid”, Commissioner for Tourism, Arts & Culture, Mr. Folorunsho Coker; Special Adviser, Office of Overseas Affairs & Investments, Prof. Ademola Abass and Commissioner for Information & Strategy, Mr. Steve Ayorinde, during the Grand Finale of the One Lagos Fiesta, at the Bar Beach, Victoria Island, Lagos, on Thursday, December 31, 2015. 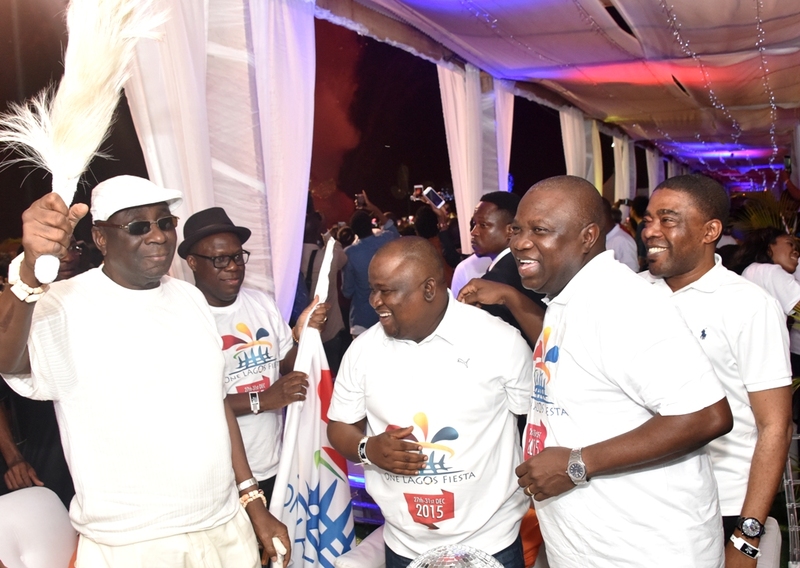 Lagos State Governor, Mr. Akinwunmi Ambode (2nd right), with Senator Ganiyu Solomon; Senator representing Lagos West Senatorial District, Olamilekan Adeola Solomon; Attorney General & Commissioner for Justice, Mr. Adeniji Kazeem and Oba of Lagos, Oba Rilwan Akiolu I, during the Grand Finale of the One Lagos Fiesta, at the Bar Beach, Victoria Island, Lagos, on Thursday, December 31, 2015. 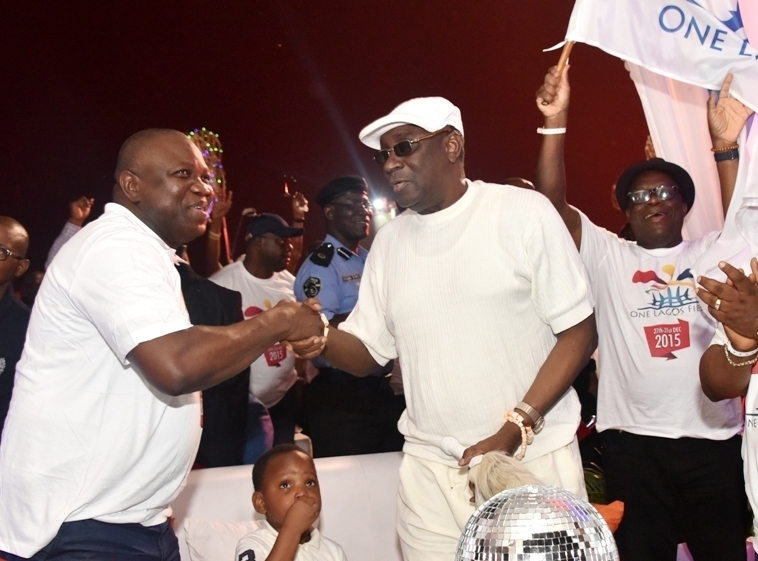 Lagos State Governor, Mr. Akinwunmi Ambode (left), exchanging pleasantries with Senator Ganiyu Solomon (right) while the Oba of Lagos, Oba Rilwan Akiolu I (middle), watches with admiration, during the Grand Finale of the One Lagos Fiesta, at the Bar Beach, Victoria Island, Lagos, on Thursday, December 31, 2015. 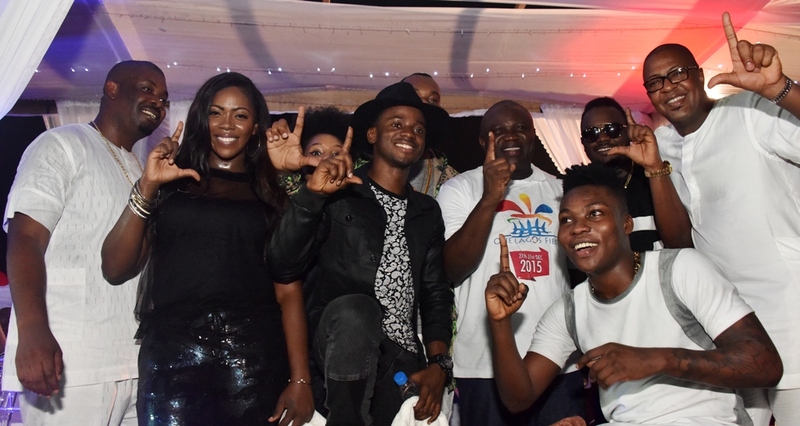 Lagos State Governor, Mr. Akinwunmi Ambode (3rd right), Commissioner for Tourism, Arts & Culture, Mr. Folorunsho Coker (right) with the Marvin Crew – Don Jazzy; Tiwa Savage; Korede Bello; Dr, Sid and Reekado Banks, during the Grand Finale of the One Lagos Fiesta, at the Bar Beach, Victoria Island, Lagos, on Thursday, December 31, 2015. 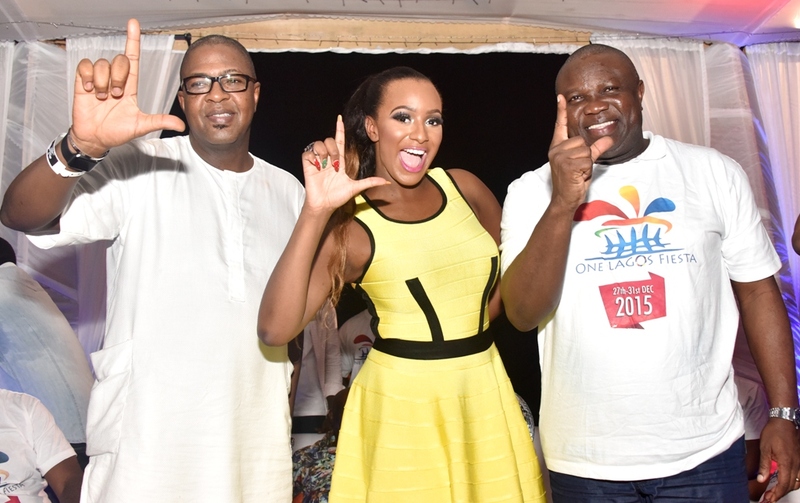 Lagos State Governor, Mr. Akinwunmi Ambode, with Florence Ifeoluwa Otedola “DJ Cuppy” and Commissioner for Tourism, Arts & Culture, Mr. Folorunsho Coker, during the Grand Finale of the One Lagos Fiesta, at the Bar Beach, Victoria Island, Lagos, on Thursday, December 31, 2015. Lagos State Governor, Mr. Akinwunmi Ambode (middle); Special Adviser, Office of Overseas Affairs & Investments, Prof. Ademola Abass; Senator Ganiyu Solomon; Senator representing Lagos West Senatorial District, Olamilekan Adeola Solomon and Attorney General & Commissioner for Justice, Mr. Adeniji Kazeem, during the Grand Finale of the One Lagos Fiesta, at the Bar Beach, Victoria Island, Lagos, on Thursday, December 31, 2015.